Chris Rasch is attempting to build a temporary island out of an unremarkable pile of plywood, rope, and empty barrels that once held 50 gallons of maraschino cherries each. Construction of this manmade island on the Sacramento River delta in California is running something like 24 hours behind schedule, but by the end of the second day, Rasch and a few dozen like-minded souls have finished enough of the project to relax over a dinner of kabobs, chili and curry served aboard their mostly finished homestead. The result may look a bit ramshackle, complete with a pirate flag flying from a mast that was a spare piece of lumber, but the roughly 125 people who gathered here earlier this month believe it represents the first step toward conquering humanity's next frontier: the colonization of the world's oceans. "A lot of people interested in seasteading have never been on the water before," says Rasch, a 37-year old programmer whose day job is a programmer for Marketocracy in San Mateo, Calif. "They don't know what the problems are. They don't know what it's actually like. Having events that are in a safe environment where they get some experience — where if anything goes wrong they can easily recover — is a good thing." That makes the hand-built contraptions that dotted the Sacramento delta this month an intentional prototype of a permanent presence on the high seas, perhaps in the same way that Yuri Gagarin's orbital flight and the Apollo program eventually led to the creation of the International Space Station and tourist voyages like the one recently taken by Cirque du Soleil founder Guy Laliberté. "I think seasteading, long term, will create a place where people can go to and be much more free than what we have now," Rasch says. "The two freedoms that particularly drive me are the freedom to move — to immigrate — and the freedom to innovate, especially medical innovation. I think a lot of new scientific advances are stifled in the United States because getting a new drug or medical device approved can be in the range of half a billion dollars." As any undergraduate political science major can attest, wildly different political structures are entertaining discussion topics. But the practical challenges of engineering a seastead are formidable: Even hostile environments on land don't need to weather the full brunt of typhoons and prepare for the possibility of sinking into the deep. And fresh water and arable soil aren't readily available on the high seas. A two-day conference that the Seasteading Institute held in San Francisco before the expedition to the delta (which they dubbed "Ephemerisle") wrestled with questions about business models, engineering, hydroponic gardening and whether the first ocean 'stead should be a refurbished cargo ship, a modified cruise ship or a floating platform designed from the start for long-term human habitation. Mikolaj Habryn, who works as an engineer at Google as a day job, suggested the cruise ship option, estimating that a 381-foot ship could sleep 500 passengers in 231 cabins and cost $8.5 million. A 470-foot vessel with 420 cabins would be closer to $11 million, he said. Na'ama Moran, an Israeli entrepreneur who previously founded a mobile startup, was looking for investors to fund a medical tourism venture that would begin with a refitted cruise ship and offer cosmetic, orthopedic, dental and other procedures for much less than U.S. health care providers would charge. The idea, Moran said, is to pick up medical tourists from American cities and "couple medical treatment with a cruise vacation" outside any nation's territorial waters. 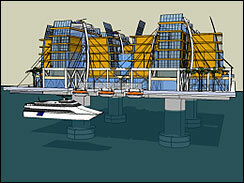 Patri Friedman, the executive director of the Seasteading Institute and grandson of the late Nobel laureate Milton Friedman, was unabashedly optimistic: he envisions creating the world's first independent ocean settlement by 2015, with at least 50 full-time residents and a living area the size of a football field. The first task, he said, was to figure out where on the world's oceans would be the most suitable place. "Based on the specific location we'll create the engineering design," Friedman said, while simultaneously looking for funding as a for-profit venture. History, of course, is littered with corpses of similar projects that failed. There was Marshall Savage's Aquarius Project, which wanted to start by colonizing the ocean surface and then move to the stars. A Las Vegas real estate tycoon behind the Republic of Minerva wanted to create a no-tax utopian society by reclaiming land on a Pacific atoll; alas, the colonists were given the boot by a few troops from the island-nation of Tonga. The free-marketeers behind Laissez-Faire City who wanted to create the next Hong Kong were never able to find a sympathetic government to lease them land. Engineer Norman Nixon has been trying for years to find investors for a so-called Freedom Ship, which would be a colossal project three times longer than any existing ship with twenty-five stories above the waterline and a fully-functioning airport. Nixon acknowledged in a bizarre post last July that the project was on indefinite hold because his business partner "turned over our entire bank account to a man who promised him a 'Peruvian Gold certificate' worth a billion dollars." These are all cautionary tales for the current crop of seasteaders, who are sufficiently aware of their predecessors' failings that they've drafted a critical history of the movement as part of a larger Internet-published book. Friedman believes that the solution is for a permanent colony to grow gradually, and expects that annual temporary festivals will evolve into a full-time presence on the water. 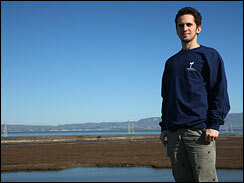 In a year or two, he'd like to see the festival floating on the waters of the San Francisco Bay. Which might explain the eclectic group of 'steaders who gathered for the first Ephemerisle: the suburban crowd who rented houseboats and talked politics, and the artists who created a remote-controlled glowing squid and illuminated water lillies. 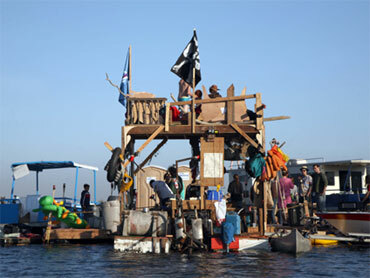 Then there were the Burning Man types, including Burning Man board member and onetime Fairchild Semiconductor employee "Danger Ranger", who labored for days constructing floating platforms that could be used as a communal social space. "The consensus is that next year we'll do it again in the delta," says Rasch, who helped to build the floating platform. "Some people, like me, were attracted to the political aspects. Other people were attracted because they like building things on the water, or solving technical challenges. There's virtue in the camaraderie you get when you build an art project or a platform. The platforms we're building aren't appropriate for the open ocean, but the friendships will survive." Declan McCullagh is a correspondent for CBSNews.com. He can be reached at declan@cbsnews.com and is on Twitter as declanm. You can bookmark the Taking Liberties site here, or subscribe to the RSS feed.